Bild: Tecknaren Bernie i The Spectator. VAL 2016 | Rädsla är en viktig motivationsfaktor inför ett val. Den sida som kan måla upp ett trovärdigt skräckscenario har en rejäl fördel. 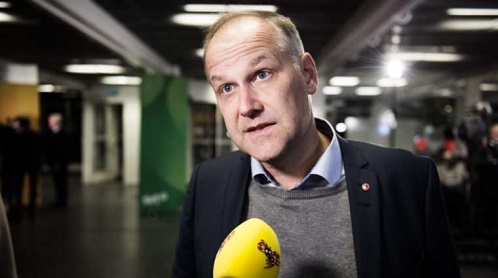 Detta gynnar ofta anhängarna till status quo eftersom ingen kan bevisa hur framtiden kommer att gestalta sig. För- och nackdelarna med ett medlemskap i EU är svårt att kvantifiera. Frågan är så komplex att inte ens experterna kan ge någon tydlig bild av de ekonomiska konsekvenserna av medlemskap för vare sig enskilda medborgare eller för medlemsländerna. Anhängarna till ett EU-medlemskap har en fördel eftersom man alltid kan hävda att en förändring riskerar det man redan uppnått. Så länge som nuläget inte har inneburet påtagliga nackdelar för väljarna kan man alltid hävda att vi vet vad vi har men inte vad vi riskerar att få om man röstar för ett utträde. 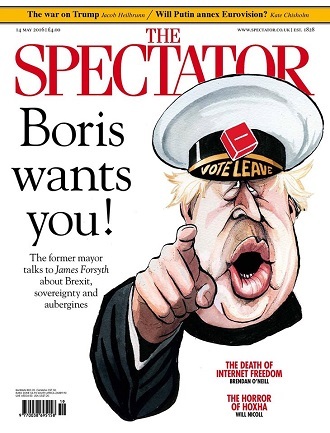 Charles Moore på The Spectator har noterat att kampanjen Vote Leave har haft svårt att möta de argument som Vote Remain har pumpat ut inför folkomröstningen. Inte minst för att Vote Remain har hela regeringskansliets resurser till sitt förfogande. Vote Leave ser ut att sakna ett effektivt ”war room” som kan neutralisera alla påstående om påstådda negativa konsekvenser av Brexit. The Leave camp sometimes looks stumped because it cannot give a precise answer to what would happen economically if we were not in the EU. This is always a problem for people who believe in freedom rather than government control. In the 1970s, inflation and bad labour relations were the enemy. It became an article of faith among the elites that the answer was a ‘prices and incomes policy’ in which wise people, managed by governments, decided what should be the fair relation between the two. The widely worshipped J.K. Galbraith explained in 1975 that ‘pay and price curbs will be a permanent feature, both in Britain and in every other industrial nation’. Anyone who suggested otherwise had to put up with ‘How on earth will you control it? What will you do about industrial anarchy?’ People who said that essentially the best thing to do was to break the automatic linkage between pay and prices and then see what happened next were considered mad. By the 21st century, no western country any longer had such curbs, and even the heirs of Galbraith are not trying to bring them back. 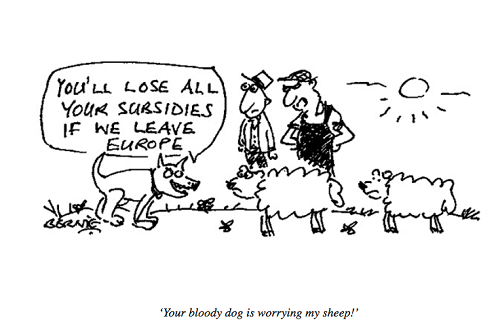 Almost all of the economic arguments for membership of the EU are based on fear of freedom. It is, unfortunately, a powerful emotion. One thing I miss in the No campaign is a front-rank real expert, rather like that man on the radio called Bill Frindall who used to know every cricket score in history. As the government publishes every day of the campaign a stupendous amount of facts whitch are not true, it is no good just complaining. You have to refute them, giving chapter and verse. It is a difficulty for the Leave camp that most of its members, because they do not like rule by Brussels, are not absolutely secure in their knowledge of its details. An exception is Daniel Hannan. Vote Leave should put him forward more. Kampanj: Argumenten för Vote Leave! VAL 2016 | Vill vi att det parlamentariska systemet skall urholkas? Det är den fråga som Boris Johnson vill att väljarna skall ställa sig inför folkomröstningen. Den populära f.d. borgmästaren i London har blivit den främsta talespersonen för Brexit, kampanjen för Storbritanniens utträde ur EU. Han är dessutom tippad att bli nästa partiledare för Torypartiet om David Cameron inte lyckas få väljarna att rösta Ja till ett fortsatt medlemskap. En myt som Johnson slår hål på är att EU skulle vara så bra för näringslivet och konkurrensen. En märklighet i den politiska debatten i både Sverige och Storbritannien är att partier som i vanliga fall talar om hur viktigt det är med konkurrens på marknaden inte verkar tycka det är viktigt på den europeiska marknaden. Hade man verkligen tyckt konkurrens var viktigt skulle man inte stillatigande acceptera all den byråkrati som hämmar just konkurrensen inom EU. He has a book on Shakespeare to finish, a Brexit campaign to win, and, if the bookmakers are to be believed, a Tory leadership campaign to assemble. He’s currently red-hot favourite for the top job. So what kind of relationship does Boris want with the EU after Brexit? He knows what he doesn’t want: ‘the so-called single market’, which he says is a problem rather than the solution. ‘People think the single market is a great wonderful European souk or bazaar in which you will find absolutely everything humanity could possibly desire: aubergines, derivatives, trucks, ballistic missiles…’ But, unfortunately, the single market is ‘a gigantic system’ that imposes ‘extremely detailed and onerous rules on a territory of 500 million’. He is confident that his two great historical heroes would be on his side in this struggle. Churchill would not have wanted ‘parliamentary sovereignty to have been so compromised. I think he believed in that above all else. He would have felt it had gone too far.’ And he contends that Pericles, the great Athenian statesman he so often cites, would also have been an Outer. Boris argues that ‘to stick up for democracy is entirely Periclean’ and that the referendum ultimately comes down to whether you believe in ‘rule by the many, not the few’. Tidskriftsomslag: The Spectator den 14 maj 2016. Kampanj: En tidig folkomröstning gynnar Ja-sidan! VAL 2016 | Som det ser ut nu kommer premiärminister David Cameron att få ett Ja i folkomröstningen om Storbritannien skall stanna kvar i EU eller inte. Som så många gånger i valrörelser handlar det inte bara om att ena sidan kampanjar väl utan lika mycket om att motståndarna är riktigt dåliga. Trots att ingen, inte ens EU-anhängarna, blev speciellt imponerade av innehållet i det avtal som Cameron tog med sig hem från EU-förhandlingarna verkar motståndarna blivit helt tagna på sängen. Anhängarna av Brexit verkar varken kunna formulera ett konsekvent budskap eller få sin kampanjorganisation på plats. Och med tanke på det tidiga datumet för folkomröstningen måste man på bara några månader göra det man skulle behöva år för. 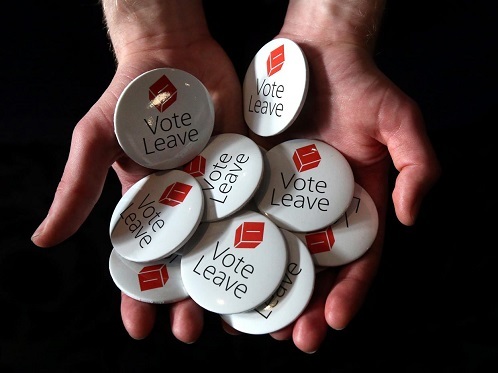 Eurosceptics could hardly have asked for more favourable conditions for a referendum. After barely surviving a financial crisis, the European Union has been overwhelmed by an immigration crisis — one made much worse by its failure to control its own borders. The European Commission seems determined to make itself even more unpopular in Britain, and is considering whether VAT should be levied on food and children’s clothes. At a time of righteous anger at sweetheart tax deals for multinational corporations, the man who bears more responsibility for these than anyone else in Europe is its president, the former Prime Minister of Luxembourg, Jean-Claude Juncker. Then came David Cameron’s renegotiation. After months in the kitchen, Cameron has come up with the political equivalent of nouvelle cuisine: a tiny, disappointing dish served up with a big fanfare. He has nothing, for example, on the Common Agricultural Policy, or the fisheries policy that has inflicted such misery on British seaside towns. When he proposed the referendum three years ago, he spoke of a fundamental recasting of Britain’s relationship with the EU. This has been abandoned. Donald Tusk, president of the EU Council, confirmed after unveiling the proposed deal that the principles of the EU would not be altered by it. So this ought to be the moment of Eurosceptic triumph. Instead, the movement is in chaos. The arguments for Brexit are all there, waiting for someone persuasive to marshal them. Events could also intervene. Cameron and Osborne are so keen to get this vote over as soon as possible because both know how volatile the situation is. A repeat of last summer’s migrant crisis, another ‘Cologne’ or the eurozone going to the brink again could sway public opinion towards quitting the EU. Yet at the moment Britain is sleepwalking into an ever more centralised EU, and the painful truth is that Euroscepticism is not ready for the confrontation that it has so long agitated for. With the government intent on a June referendum, the ‘out’ campaign will have a few months to do the work of years. If it cannot do that, then Britain will stay in the European Union. More than that, voters will have ratified the transformation from the European Economic Community that we joined in 1973 to the imperial institution that the European Union is today. 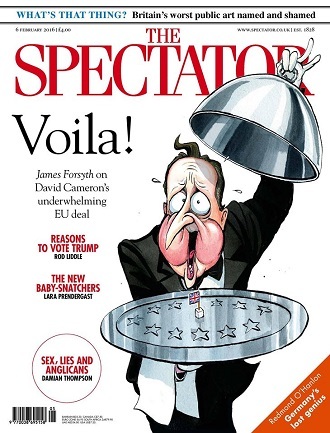 Tidskriftsomslag: The Spectator, 6 februari 2016. DE STORA FÖRLORARNA i det brittiska valet blev Liberaldemokraterna. De förlorade både i lokal- och regionalvalen och i folkomröstningen. Och nu kommer anklagelserna mot David Cameron och de konservativa. ”Some of us never had many illusions about the Conservatives, but they have emerged as ruthless, calculating and thoroughly tribal”, sade business secretary Vince Cable. Ross Hawkins, politisk korrespondent på BBC News, sammanfattar hur eftersnacket och de olika lägrens spin kommer att låta. Many Lib Dems will attribute the outcome to David Cameron who they say campaigned hard for a No vote despite agreeing not to take a leading role. 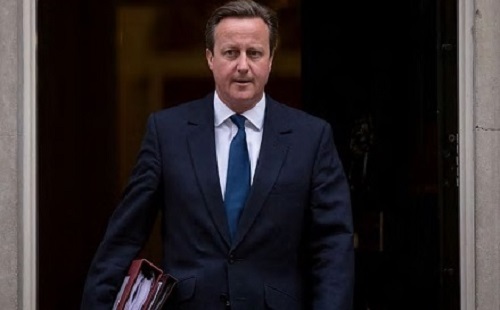 As early as February the prime minister had no qualms about reminding people Nick Clegg had once called the alternative vote a ”miserable little compromise”. Despite all this, millions of people voted and even in areas where no other elections were taking place, like London, the turnout was comparable to that seen at local elections. Those who favoured the Yes campaign will argue they were defeated by the prime minister’s campaigning power, a largely hostile press and a tough opposing campaign. They will also wonder whether people who voted against the Lib Dems in the elections might have been keen to oppose Nick Clegg’s favoured electoral system at the referendum. Those who backed a No vote will say they won the argument for the merits of the status quo, and persuaded people the alternative vote was complex and unnecessary.